fcbs registration "Named by K Tate, N.S.W. AU. Possible Australian remake of European then-called X Nidumea ‘Loeseneri’. To 40cms diam. x 50cms high in spike. Refs. Bromeliaceae (Qld. Journal 2009). Pinegrove Nursery ledger #913(Nidumea x ‘Loeseneri’ 2/84 Ferris). BSI Bulletin 18(3):62-3 1968. Reg. Doc. 5/2009 by D. Butcher. A tough, free-flowering brom, with the long-lasting inflorescence changing to a rusty orange/red colour post flowering. See notes below pictures for new classification. Ian Hook from eBay 04/08. Ian Hook Sydney 04/09. Kerry Booth Tate 04/07. Darrel Whelan. 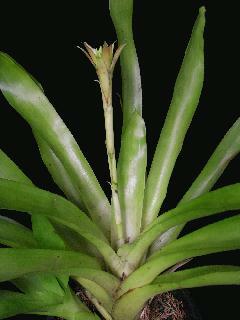 Synonyms Aechmea loesenera hort. ex Gentil, Pl. Cult. Jard. Bot. Brux. 9. 1907. Nomen. Nidularium loeseneri Mez, Fedde Rep. Spec. Nov. 16: 5. 1919. Cultivated in the Berlin Botanic Garden from material obtained from Brussels, 26 April 1911, H. Strauss s.n. (Berlin, type; Chicago phot. 11272). It is doubtless a risky move to describe the above species as a bigeneric hybrid with no confirmation from the living record, but comparison with the two supposed parents leaves no character unaccounted. Furthermore the horticultural origin is a suspicion of hybridity and the badly malformed pollen a fairly positive proof of the same. This xNidumea loeseneri is an anomaly which is correctly named under the ICBN rules but how does a Cultivar Registrar deal with it? 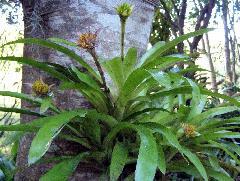 We know that a plant can be newly named just from a 100 year old herbarium specimen as in Hohenbergia oxoniensis Weber. How anyone could link this to a plant in the wild is problematical but the name appears in Harry Luther’s Binomial listing. We know from the above comments by Lyman Smith, the doubt about xNidumea loeseneri being a man-made hybrid but this name does not appear in the Binomial listing. But 3 xNiduregelia with the same sort of history do appear! The ICNCP rules show that a plant must be alive and in circulation for it to have a valid cultivar name. This seems reasonable enough! xNidumea loeseneri does not pass this test which is why this name now occurs in the records on http://fcbs.org as a Natural hybrid! 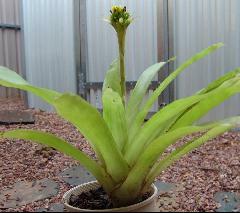 In May 2009 a plant called xAechopsis ‘Loeseneri’ cropped up at a meeting of the Bromeliad Society of SA. and caused consternation two weeks later when Derek Butcher returned from holidays!. As you will have read, this plant had been dead for so many years. How could it have been reincarnated? 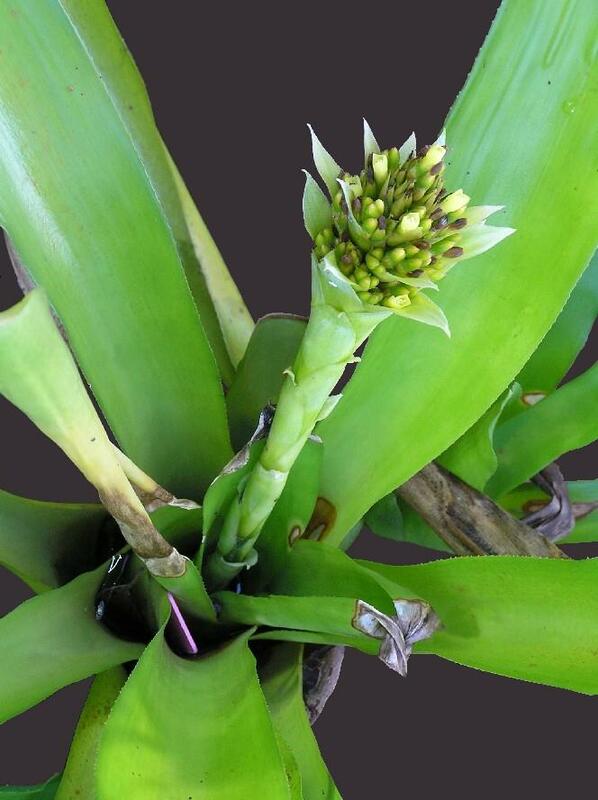 Investigation showed that Kerry Tate from The Channon, NSW, had bought a plant under the formula Nidularium billbergioides x Aechmea calyculata. On reading “Growing Bromeliads” by the Bromeliad Society of Australia page 127 under xNidumea, she realised this had to be her plant and promptly changed the name on her label to xAechopsis ‘Loesneri’. It probably was her plant and it was supposed to have been imported to Australia during World War II. 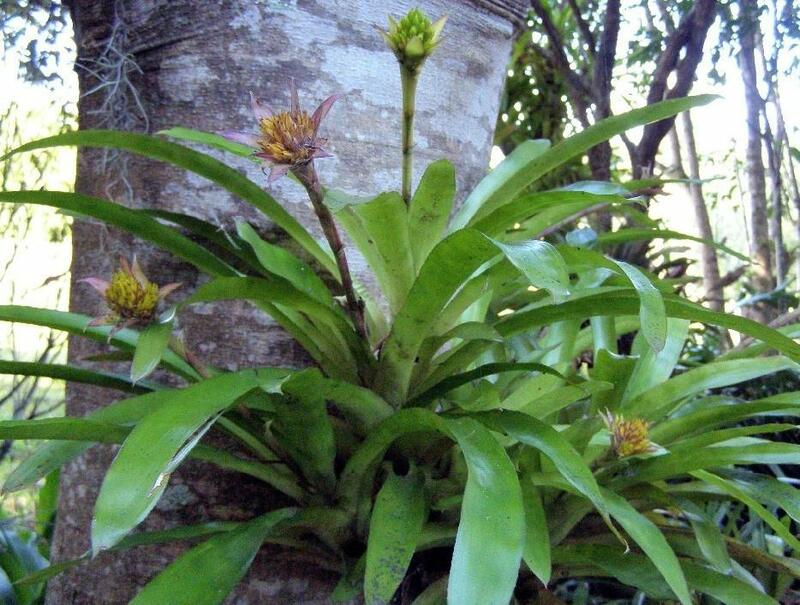 Ian Hook obtained one of Kerry's plants and listed it on "Bromeliads in Australia" web site as xAechopsis loeseneri. At the time of supposed import it would have been known as a Nidularium! I maintain that this importation was a guess on someone’s part because from the facts above, the plant probably died in Berlin in WWII. Lists available to us of plants being grown by Bromeliad fanciers before the formation of the Bromeliad Society of Australia in 1963 do not reference this name. 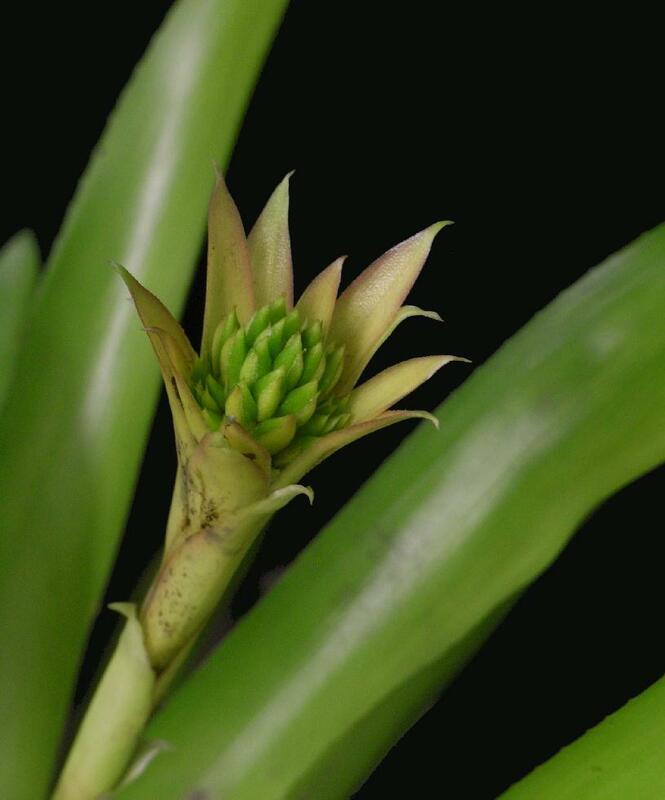 It was not alive when Lyman Smith looked at it in 1968 when he guessed the parentage to be Nidularium billbergioides and Aechmea calyculata. A greater chance would be that it was a re-make. History shows us that hybridists have been known to re-make a hybrid using the same alleged parents and assume they had re-created it. Alas they did not realise that Cultivars can only be propagated asexually ( by offsets etc) The only time it can be done by seed is that if the same clonal parents were used AND progeny ruthlessly selected – this is what Bak does- so that the new crop of seedlings is the same as or very similar to, the previous batch. We know, that in Australia, Olwen Ferris crossed plants mentioned in prevous hybrids because she did not have these hybrids herself. I picked her up on some ‘old’ Billbergia hybrids she had done so we know that there are some of the old 1900 European hybrids with Aussie origins growing in Australia! I don’t know which ones! More recently I picked up Don Beadle doing the same thing but only because I got access to the original painting – see Billbergia ‘Vexillaria’. Clearly the answer must lie in northern New South Wales. This means the trusted LEDGER of PineGrove nursery comes into play. Here we read "#913 Nidumea ‘xLoeseneri’ 2/84 Ferris (Nid. billbergioides citrinum x Ae. calyculata)". Now this is interesting because the names are not exactly the same as those quoted by Lyman Smith and suggest strongly a re-make. This plant does not feature in Ferris’s catalogue for the period so it could well be another hybridist. Investigation of catalogues in the USA draw a blank so the problem seems Australia made. 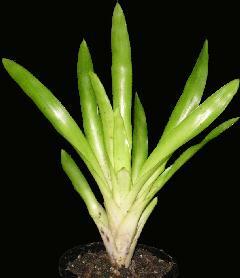 Let us now look at xAechopsis as known in Australia and where Canistropsis billbergioides features in every case. We know how variable this species can be because of the number of Cultivar names it has! First to be ‘solved’ was xAechopsis ‘Angeline’, a variegated plant that seems to retain its variegations which was traced back to a strange name used by Kent. Next was xAechopsis ‘Karamea Sello’ that popped up in NZ and was really butchered in the interest of science. We had it provisionally as an Andrea but revelations from the LEDGER made us move it to xAechopsis! It had blue flowers. Because the inflorescence kept elongating as it flowered, you will see that we resorted to a herbarium specimen! What prompted us to instigate the change to the nothogenus name was this entry "#3045 Ae. Santa Cruz 1/87 USA (Seaborne)". This plant had flowered for Ross Little and was not an Aechmea but a possible xAechopsis. Because there was a registered plant of this name in xNidumea (now xAechopsis) but not in Aechmea we decided it had to be this bigeneric. Petals were white. Now we come to a problem. How do you tell the differences between these plants? How many other xAechopsis have been done by others and not registered? Is the plant from Ferris way back in 1984 still alive? Does it have a label? As far as we can trace, the Buchanans did not do any similar crossings. You see, Ross is finding plants in this group flowering but without labels and so far we have only nailed 3. 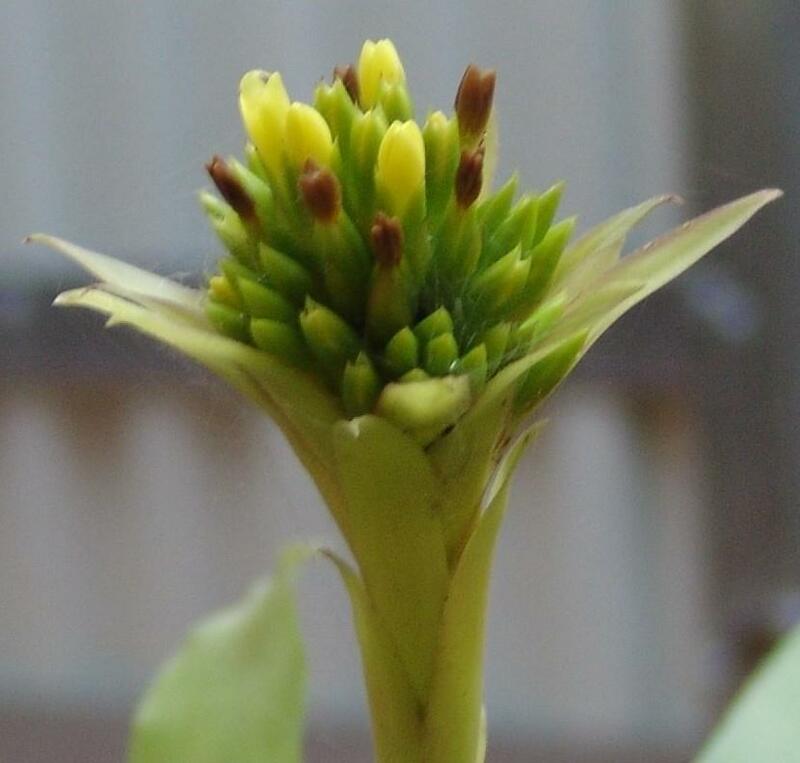 We can be fairly confident that we do have a Canistropsis billbergioides x Aechmea calyculata in Australia but we cannot link it directly to xNidumea ‘Loeseneri’. This name was made under the ICBN rules and can only be changed under the ICBN rules and I do not intend to do that. However, our plant can be named under the ICNCP rules. What better than xAechopsis ‘Lioness’! This article would not have been possible but for the active participation of Kerry Tate, Lainie Stainer, Sharon Song, Ian Hook and last but not least Ross Little.